If you are renovating your Arizona kitchen you probably already know that there is a dizzying amount of choices involved. The big ones include cabinets, countertops and flooring. The kitchen is the heart of the home, and your kitchen countertop is one of the most widely used surfaces in the home. Along with food preparation, your kitchen countertop may also be used as a desk, breakfast bar, laundry folding area or craft table, to name a few, so you want an attractive, easy to clean, multitasking surface. Most people spend about 15% of their kitchen renovation budget on countertops and installation. In Arizona, two of the most popular choices that fit the bill are Corian™ and Quartz. Let’s take a look at the pros and cons of each. Between the two, Corian™ countertop is the most widely used in Arizona. Not only that, but when it comes to customer satisfaction, over 95% of people who choose Corian™ say they will choose it again for their next project. That’s an impressive number. One of Corian™’s most popular traits is that it is a solid surface, not like the old laminate countertops. That means that if your countertop becomes chipped, scratched or even burned, you don’t have to learn to live with it until your next kitchen renovation comes along. Corian™ countertop repair and Corian™ countertop refinishing in Gold Canyon are easily accomplished because the material is the same all the way through. You can simply buff away light scratches using a mild abrasive. Deeper scratches or chips are best left for professional Corian™ countertop repair in Queen Creek. In other words, Corian™ countertops are a virtually indestructible. They are a non-porous, stain resistant, mold and bacteria resistant surface which is easy to clean and repair, although they are not impervious to heat, so do use a hot pad or trivet to avoid heat damage. Corian™ countertops, made from an acrylic and polyester blend, are sold under numerous brand names. Corian™ countertops are available in a wide array of colors, patterns, finishes, textures and shapes, and offer dozens of edge profiles. They are smooth, stain resistant and extremely durable. What’s more Corian™ countertops are custom made to your specifications in order to be completely seamless, and who likes cleaning seems? Corian™ countertops can also seamlessly integrate sink and backsplash, and they can imitate other materials, such as marble or concrete. Furthermore, if you drop a dish, Corian™ is much more forgiving than Quartz. Lastly, Corian™ countertops are less costly both to purchase and install. Our other countertop consideration, Quartz, is also durable and attractive. The Quartz countertops widely used in today’s Arizona homes is not a natural stone, it’s mixed with polymers and engineered. The mixture comes in various colors and can be made to look similar to natural stone if desired. It is available under various trade names. Although shiny and attractive, engineered Quartz doesn’t look as natural as real stone. Unlike Corian™ countertops, Quartz countertops contain visible seams. An expert installer can do a pretty good job of hiding the seams, but you may still be surprised at the amount of dirt and crumbs they collect. While it is more durable and less porous than natural stone, it can still be scratched, burnt, or even cracked, if you were to drop a heavy object near the edge. Cost wise, engineered Quartz is almost as expensive as marble. One more option (a middle ground so to speak) would be to install more than one type of countertop. For example, people who are really serious about cooking may want to use a Corian™ countertop throughout the kitchen but put a marble top on an island for rolling dough, or a butcher block area for cutting and chopping. In the end, more people choose Corian™ countertops. They are cost efficient and although they are not as shiny as stone, they are sleek and seamless and many people find the look to be more warm and inviting. Quartz countertop’s shine can become dull and scratched, which leaves you two options, learn to live with the damage or purchase costly new countertops. Corian™ countertop refinishing can keep your Corian™ countertops looking good for a lifetime. 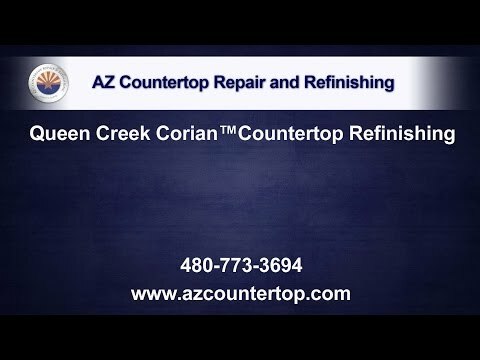 If you need Corian™ countertop repair or refinishing look no farther than AZ Countertop Repair & Refinishing. The business is owned and operated by Richard Kaiser, who has spent the last 30 years working with Corian™ countertops. Although Richard has been involved in almost every aspect of home building, he is best known for his skill in finishing and seamlessly repairing Corian™ countertops. He can accomplish many repairs that other less skilled technicians can’t. Above all, Richard is known for his integrity. He will never overpromise. If a countertop is beyond repair he will tell you so. AZ Countertop Repair & Refinishing guarantees customer satisfaction. Call today for a free estimate.